Sauce vierge is an olive oil based sauce, with fresh tomatoes, basil and lemon juice. David has his own version, Parsley Sauce Vierge, which is just as perfect and served over a piece of fish, absolutely sublime. To make the Sauce vierge (French, literally “virgin sauce”) chop baby tomatoes and allow to infuse in warmed olive oil. Add 1 clove of crushed garlic and allow the tomatoes to macerate on a medium heat to create the sauce. Add a generous bunch of chopped parsley just before serving. This sauce can be served with shellfish, delicately flavoured white-fleshed fish and with pasta. 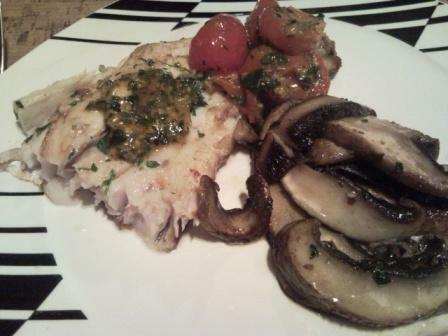 Kabeljou (Kob) is a lovely fish, and takes less than 10 minutes to cook. Season with salt and black pepper, place skin down and as soon as the fish starts to turn white, turn over and get ready to serve your meal. At this stage you can add some sliced mushrooms to the pan you are cooking the fish in. As soon as the fish is cooked remove it from the pan, and plate. Add the sauce vierge and then the mushrooms. Enjoy with a glass of well chilled sauvignon blanc. especially as it was cooked for me!